Thank you to Jane for sending this postcard from Gruinard Bay on the North West coast of Scotland. Geography Cat has selected this postcard to write a special post for Old Rock Day, apparently celebrated by geologists and fossil hunters all over the world on 7th January. Some of the rock around Gruinard Bay is some of the oldest in the British Isles and the world. The rock we’re talking about is Lewisian Gneiss. This is named after the Isle of Lewis to the west of Gruinard, it is more common there but Geography Cat hasn’t received a postcard from there! Gneiss is a Precambrian metamorphic rock. Precambrian is a period of geological time prior to the Cambrian era. Cambrian time began 542 million years ago, therefore Precambrian rocks are older than this. The planet is 4.567 billion years old, so Precambrian rocks can be anything between 542 million and 4.6 billion years old, at least in theory. In practice though, there are few rocks on the surface of the earth that remain from the birth of planet earth. Lewisian gneiss, as found on the shores of Gruinard Bay, is approximately 3 billion years old. A metamorphic rock, like this, is one that has been changed from its original state by heat and/or pressure over a long period of time. Another metamorphic rock you will know is slate. Slate used to be shale, it has been made harder by pressure over time and splits easily along one axis. The slates of North Wales are approximately 400 million years old (relative babies). 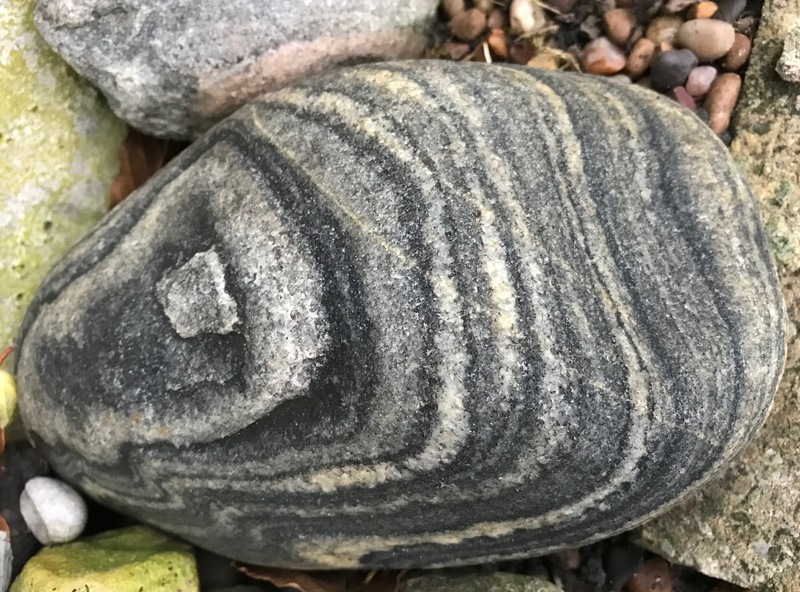 Gneiss is so old that it’s hard to tell what it used to be! Gruinard Bay looks out onto Gruinard Island. The British government used the uninhabited island to test a highly virulent strain of anthrax in 1942. The island was quarantined and even removed from maps for a time, until decontamination began in 1986. This was in response to a campaign by the group Dark Harvest who deposited some of the contaminated soil at government scientific research facility Porton Down. The island was declared safe in 1990. Geography Cat will not be visiting the island to check!